Quickly set up an account for faster checkout and other perks from Vitamin World. Why create a Vitamin World account? Check the status of your order even if you are not a registered user. Enter the Order Number, your Email Address to send it to and your Last Name. Q. How do I sign up for a Wellness Rewards™ Membership? A. You are automatically enrolled for a Wellness Rewards™ when you make a purchase on VitaminWorld.com or sign up in one of our stores. Click here for more information on Wellness Rewards™ Membership. Q. Do I need to create an online account if I already signed up for my Wellness Rewards™ Membership at a Vitamin World store? Q. How can I ensure my online purchases will earn me points? A. The easiest way to make sure you earn Points for each online purchase is to create an online account. 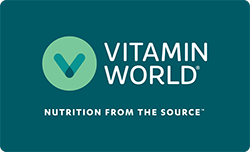 Logging into your VitaminWord.com account also makes it easy to reorder, check out, save your “Favorites,” view previous orders, and manage your shipping and billing. Be sure to use the name and address you’ve used if you’ve shopped in-store or previously ordered online. When you purchase online, simply log into your account before checkout. Click here for more information on your Wellness Rewards™ Membership. Q. How can I ensure my in-store purchases will earn me points? A. To make sure you’re earning Points on purchases at Vitamin World stores, use your Wellness Rewards™ Membership card each time you make a purchase. If you don’t have your card with you at checkout, you can provide your phone number or email address—the same one you used when you signed up for your Wellness Rewards™ Membership—and your points will be applied. Q. I'm having trouble creating an online account. A. Please visit our Help Center for questions about creating your Vitamin World online account. Q. Can I use my Vitamin World gift card to make purchases online? A. At this time, gift cards are only redeemable in Vitamin World stores. However, you can check your gift card balance online by clicking the 'Check Gift Card Balance' in the footer. To find a Vitamin World store near you, click here to visit our store locator.